Larry James is the co-owner and handles a majority of the installation, service work and other technical aspects of the business. You can get in touch with Larry by emailing him at larry@highcountrystoves.com. Becky James is the co-owner and handles the business side of High Country Stoves. She will be the person to talk to about scheduling, accounts receivable and payables and other details. You can get in touch with Becky by emailing her at becky@highcountrystoves.com. Carol Van Houten is our office associate. Carol handles most of the detailed paperwork like estimates and deposit/order forms, does scheduling and answers the phone. Carol can be reached by email at carol@highcountrystoves.com. 1989 — Larry and Becky James started in the hearth business with a chimney service company called Chimney Keepers. 1990 — Chimney Keepers began servicing customers in Laramie, Wyoming. 1991 — Stove sales began from the James’s home to customers that needed a good local source of wood stoves. 1991 — First store building purchased on 5th Street in December of this year. Initially just 4 woodstoves on display. 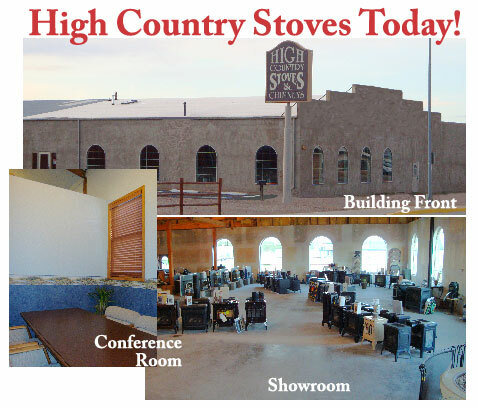 Name changed to High Country Stoves & Chimneys. 1996 — An addition was added to the first building that tripled its original size and completely filled the building lot. 2000 — Search began for a new location with better visibility and more room. 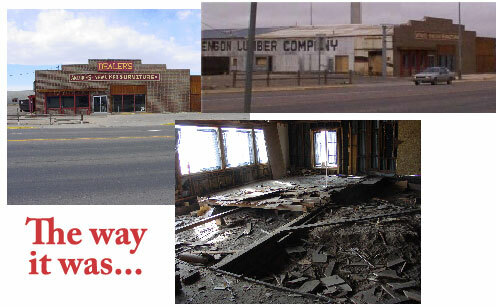 2003 — Purchased the old Swenson Lumber yard building on 3rd Street. 2004 — Major renovation accomplished to “new” building prior to moving into it in October. Plenty of room for growth with 28,000 sq feet under roof with two buildings and 1.8 acres right on 3rd Street. Larry & Becky owe their continued success to a wonderful group of customers, a hard, honest work ethic and providing the best value for a hearth appliance in their area of Wyoming and northern Colorado. The building that High Country Stoves & Fireplaces now occupies was built in 1947 as a lumberyard. Swenson Lumber Company was the first of the several lumberyards that did business here over the years. It was Dealer’s Antiques for the decade prior to Larry and Becky purchasing the building. The extensive renovation that Larry and Becky performed themselves in 2004 involved all new plumbing and electrical from the service outside to the building inside. New foundations were poured around most of the perimeter of the showroom and a new concrete floor was added throughout much of the building. To give you a small idea of what kind of project this was, here are some of the before pictures. Now here is the way the building looks now. It still isn’t finished, Larry and Becky have quite a few more ideas on ways to spiff up both the exterior and interior, and things will continue to improve over the next few years. Larry always says that putting in the stoves for their customers comes first before the finish details on the building. Chances are if you have had cable TV or listened to the radio in Laramie you may have heard the High Country Stoves jingle. If you haven’t gotten enough of it and want to hear it again, click on the musical notes below. And the answer is yes, this is Larry singing, but someone else is playing the guitar. Location of the big job. There are 27 fireplaces in the white house alone, not counting the ones in the West Wing. In August of 2001 Larry was chosen to be one of the fortunate few sweeps that spent several days providing service to the chimneys at the home of our nation’s president. 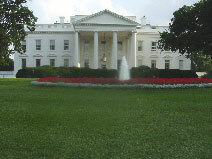 Yes, we are talking about the White House on Pennsylvania Avenue in Washington, D.C. This honor was granted to Larry because of the years he had spent in volunteer service to both the Wyoming Chimney Sweep Guild and the National Chimney Sweep Guild. This non-paying service is considered a pinnacle for a chimney sweep. It was very interesting to boot. Spending 3 days on the roof of the White House in August is very hot and sunny work, and you can see the group all has some pretty good sunburns. Thank you to Jeff Schmittinger, the head sweep whose gig this is, for this opportunity to serve. Larry on top of one of the many chimneys on the White House roof with the Washington Monument in the background. 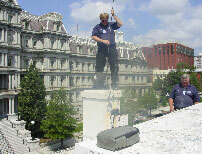 Larry cleaning the chimney for the Vice President’s Office in the West Wing. Jeff Schmittinger, the head sweep, is looking on. The Executive Office building is in the background. The entire team at the end of the job. 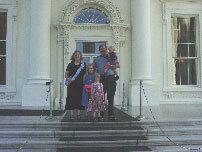 Larry and Becky with their children on the White House steps. The White House staff graciously gave a private tour at the end of the cleaning to the team and their families. 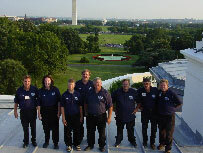 We’ve served at the White House and we’d be just as proud to serve you and your family. Our staff is ready to help you pick the perfect gas stove, wood stove or fireplace for your home, and to offer you maintenance services you can depend on. Please drop into our showroom today to view the very finest in hearth appliances at High Country Stoves, 860 North 3rd Street, Laramie, WY 82072.